8 fold out coloured maps. 240 x 160 mm (9 x 6 inches) - 201pp, cxii + maps. G: in Good condition. Ex-lib. Library rebind. Page edges browning. 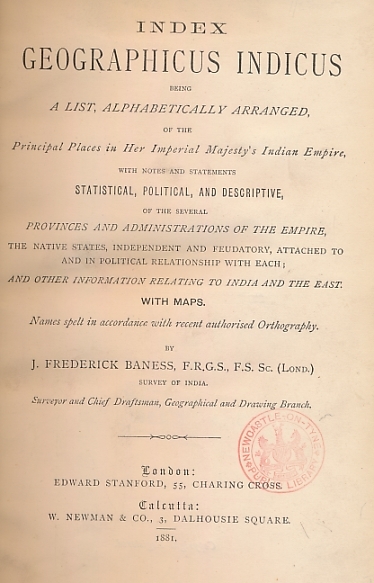 .... With Notes and Statements Statistical, Political, and Descriptive, of the Several Provinces and Administrations of the Empire, the Native States, Independent and Feudatory, Attached to and in Political Relationship with Each Other; and Other Information Relating to India and the East. Includes an Alphabetical Index, or List of Principal Indian Names Compiled from the Published Government Lists.